Monday, I took a trip to eastern Washington to hike the Coyote Wall-Labyrinth Loop. It was gorgeous! The sun was shining, the wildflowers blooming, and yes, the birds were singing! A perfect spring day to skip work and go for a hike. The labyrinth trails are just that- a tangle of trails up, over, and around the basalt hills, but because the hike is so exposed and the highway nearby to the south, it’s pretty easy to meander without worry of getting lost. 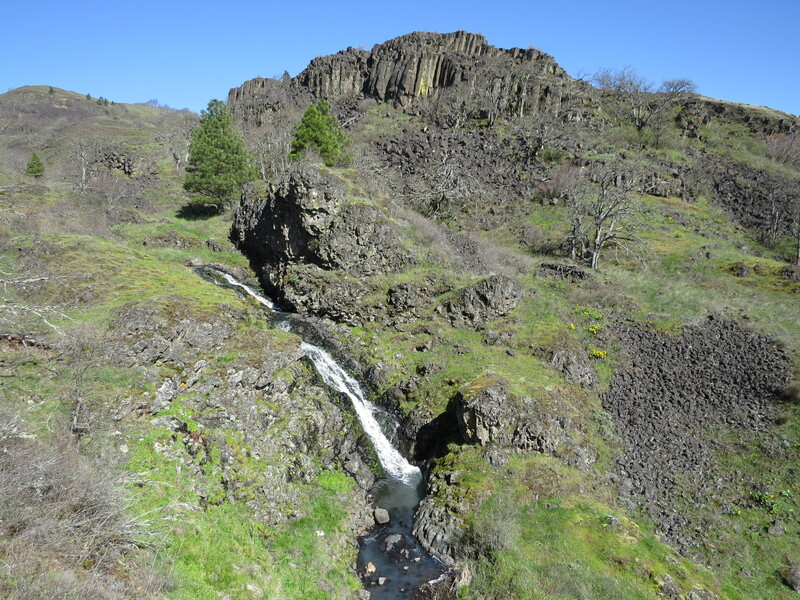 The beautiful white oak woodlands and grassland prairies of Oregon and Washington are limited and in decline yet they provide critical habitat to many important species. Hopefully management efforts will get it together to save and preserve these significant spaces. One species that benefits from grasslands is the Western Meadowlark. Though it’s Oregon’s state bird (and 5 other states: Kansas, Montana, Nebraska, North Dakota, and Wyoming) I’ve never seen one before and have been anticipating an encounter since I began paying attention to birds. Upon my arrival, I immediately heard the meadowlark’s song!…but didn’t see anything. I continued along the trail, noticing all the flutters and chirps of so many birds. I saw some common ones I’ve grown to know better, Western Scrub-Jay, Dark-eyed Junco, Northern Flicker, Spotted Towhee, and even a Yellow-rumped Warbler, American Kestrel, and Red-tailed Hawk. 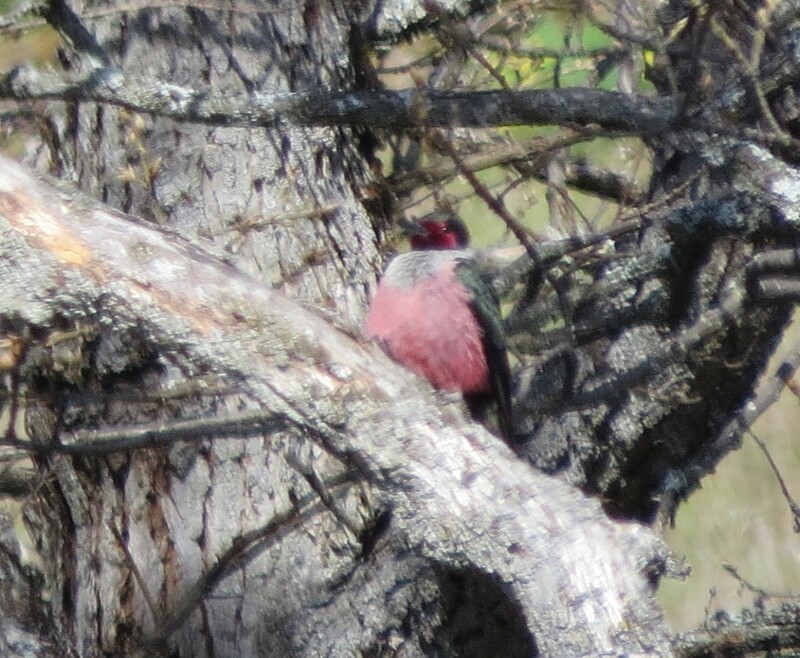 I also came across some uncommon birds, like this funny pink blob. Is that even a bird? Yes, it is! It’s the Lewis’s Woodpecker! I so wish I had the chance to take a better picture, but the next moment a hiker joined by two dogs rounded the corner and the bird flew off. Still, it was a cool sighting, and knowing this bird is there is a great excuse to go back to try and find it again. I heard the Canyon Wren before I saw it. Such a unique song! 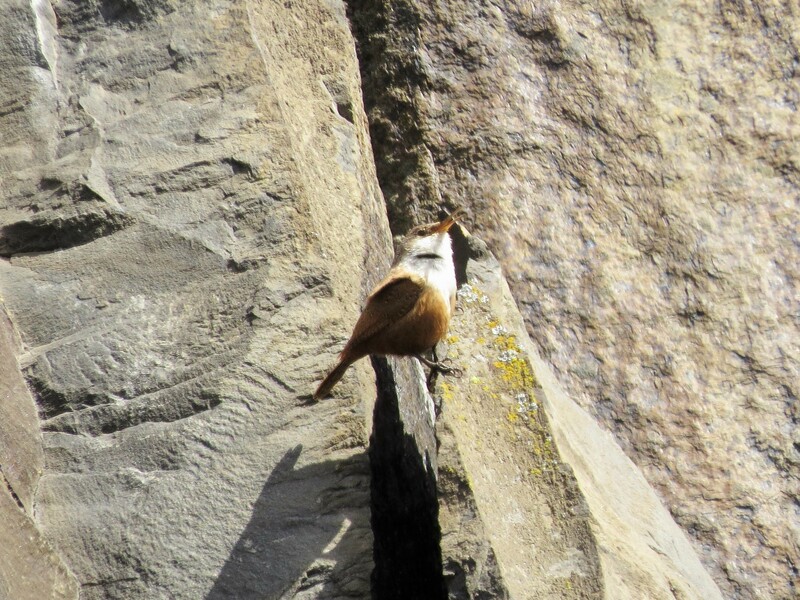 I think the hike should be called “Canyon Wren Wall,” there were at least three pairs I saw throughout the day. 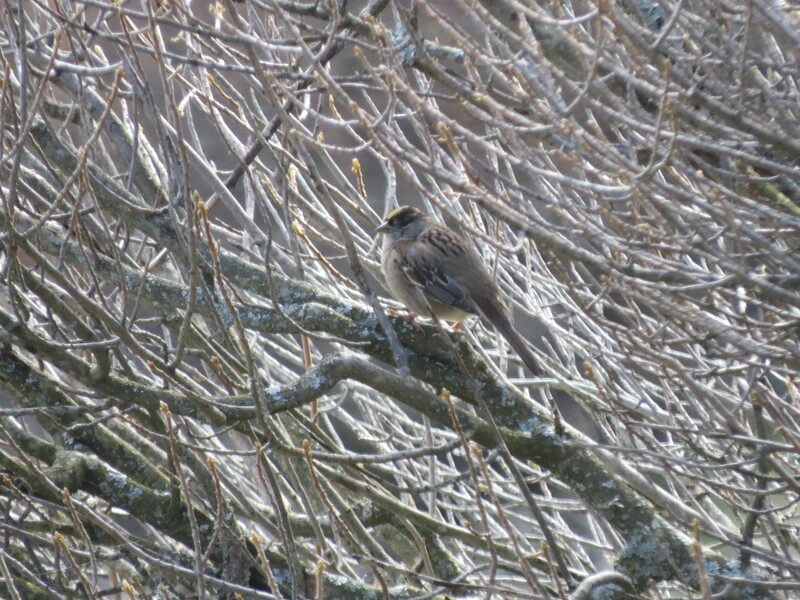 I also came across a pouty looking Golden-crowned Sparrow. Maybe he could learn a thing or two from the bluebird of happiness. 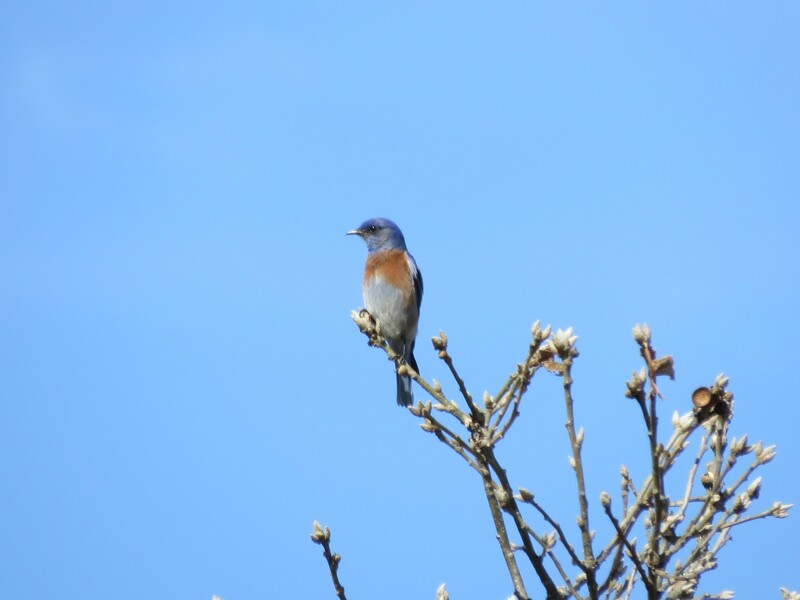 A Western Bluebird! What a treat! By this point in the hike, I thought surely I would have seen a Western Meadowlark. I continued to hear the song, but I started to doubt that it was a Western Meadowlark. Maybe it was a thrush instead? Hmph. I wanted to find that bird. I followed the sound back up the canyon. Then down. At one point it sounded like it was right in front of my face. 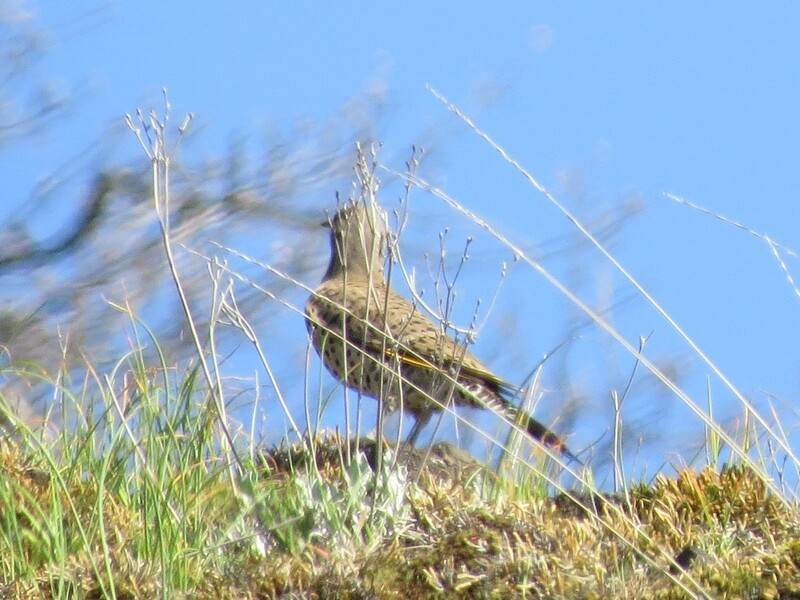 Definitely a Western Meadowlark, but I still couldn’t see it. Sometimes you see the bird, sometimes the bird sees you. There, on the ground! Is that a meadowlark? It’s a good thing I’ve taken a beginner’s birding class so know to focus on the field marks. As I compared this photo to the meadowlark in the field guides, I could see that the spots on the belly and back don’t quite match. And the tail is definitely wrong. It looks too long, and the black tip at the end…that’s the tail of a Northern Flicker. Outbirded again! But here. 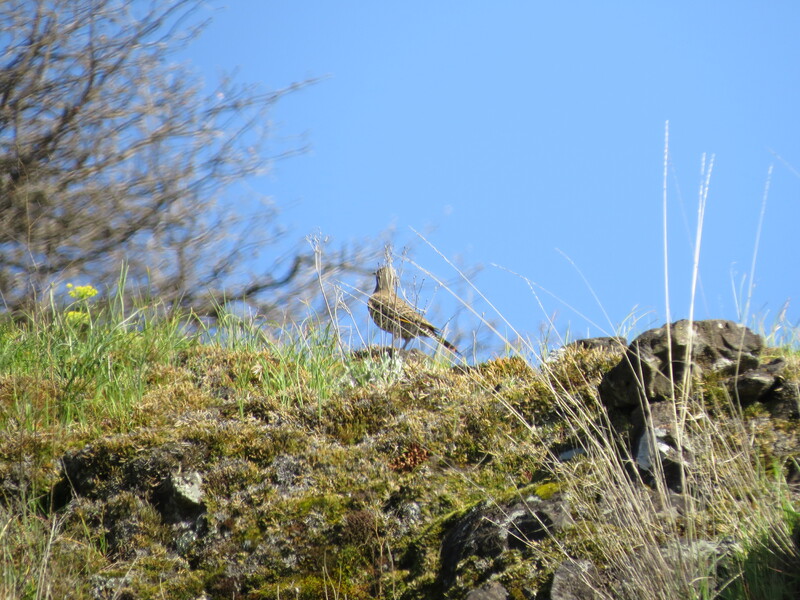 Here is the only picture I got of a Western Meadowlark. 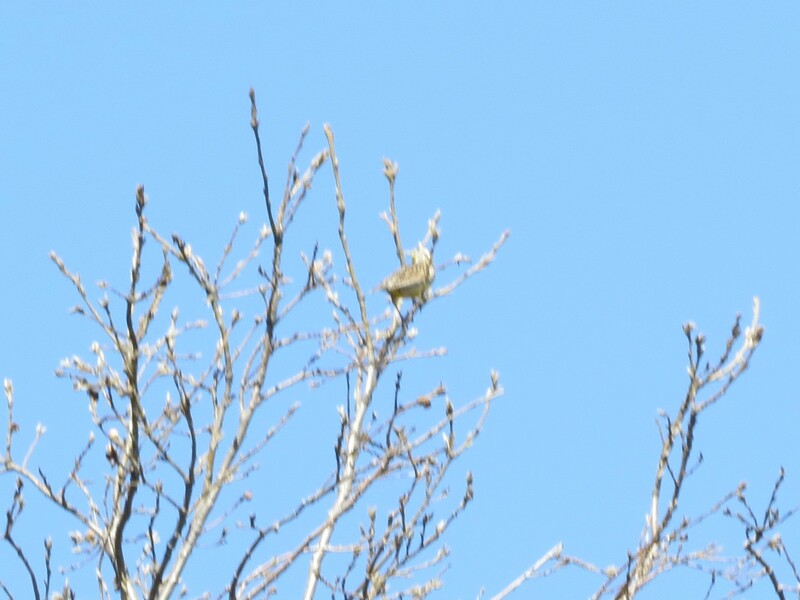 It’s pretty comical how bad the single photo I got of the bird is after how much effort I put in trying to find it. Oh well, next time! 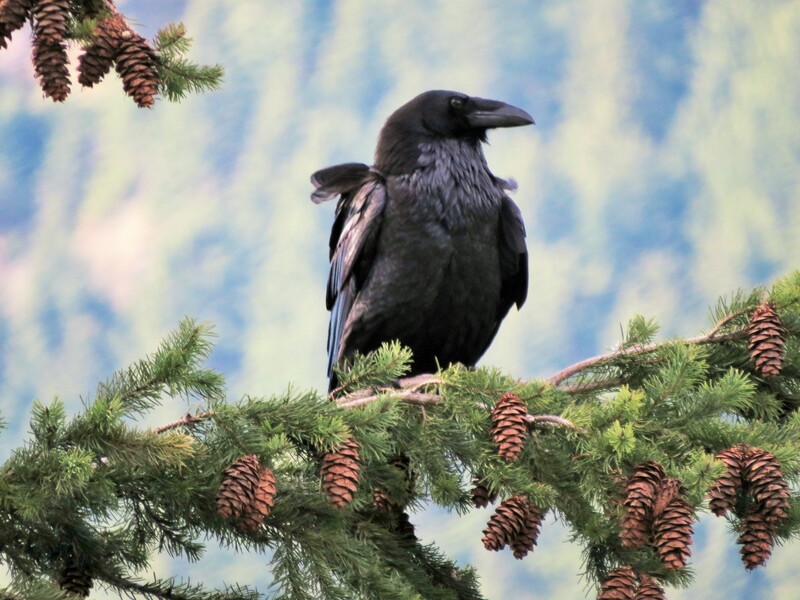 Here’s a nice picture of a Common Raven instead. This entry was posted in Birding Trips and tagged American Kestrel, Canyon Wren, Common Raven, Dark-eyed Junco, Golden-crowned Sparrow, Lewis's Woodpecker, Northern Flicker, Red-tailed Hawk, Spotted Towhee, Western Bluebird, Western Meadowlark, Western Scrub-Jay, Yellow-rumped Warbler by audge29. Bookmark the permalink. That canyon wren video is adorable! Thanks!! They are so freakin’ cute!